Capcom VP Chritian Svensson says the PC port of Resident Evil 6 is going to take awhile, because nobody wants another Resident Evil 4. PC ports are harder than they look. So says Capcom Senior Vice President Christian Svensson, who recently asked for patience when pressed about when the PC version of Resident Evil 6 might be ready. "It is a small, but appropriately sized team working on the RE6 PC project. It is a different group than originally planned, lest it would have taken even longer than it currently will but this team will do a better job than what was being considered originally," he wrote in the "Ask Capcom" forum. "The process did not begin until after the console versions were complete, submitted, approved by console 1st parties to use that final codebase as the starting point," he explained. "It will be some time still before we provide details on release dates and PC specific parameters." Capcom is taking its time with Resident Evil 6 in large part because of the mess that was the PC port of Resident Evil 4, which lacked mouse support and suffered from shoddy keyboard controls, decidedly sub-par visual quality, rendering issues and other problems. Svensson acknowledged that those issues were the result of rushing its development. "Projects like this you guys seem to think are 'trivial' but they are not," he said. "When they get treated as trivial, you end up with Resident Evil 4 PC... which I don't think too many true fans were pleased with." 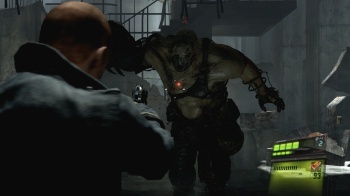 Earlier this month, Svensson said the PC version of Resident Evil 6 would take "several months" to complete.